With more than 200 different chips, corn nuts and pretzels, a major contribution to our vast snack section, whatever kinds of chips you want, you can find right here. 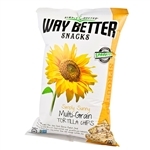 Choose from the three main chips sub-categories – Kettle Chips, Bagel Chips and BBQ Chips – as well as pretzels (30 choices) and corn nuts (9 Kraft Nabisco options). Buy everything from wholesale pretzels and corn chips to individually wrapped chips and vending machine chips. Hain Celestial Terra Spiced Sweet Blue Potato Chips - 1 Oz. Hain Celestial Foodservice Original Terra Chips - 10 Oz. Hain Celestial Original Terra Chips - 1 Oz. Hain Celestial Original Terra Vegetable Chips - 6.5 Oz. The Inventure Group Boulder Canyon Totally Natural Chips - 1 Oz. The Inventure Group TGI Fridays Cheddar Bacon Potato Skins 3 Oz. The Inventure Group TGI Fridays Chile and Cheese Potato Skins - 3 Oz. The Inventure Group TGI Fridays Sour Cream and Onion Potato Skins 3 Oz. Original All Natural Single Serve Popchips - 0.8 Oz. Jalapeno Potato Chips - 5 Oz. Totally Natural Canyon Potato Chips - 1.5 Oz. Hickory Barbeque Potato Chips - 1.5 Oz. Jalapeno Potato Chips - 1 Oz. New York Cheddar Caddy Potato Chips - 2 Oz. Sea Salt and Vinegar Potato Chips - 1 Oz. Tgi Fridays Potato Skins Bacon Ranch Chips - 3 Oz. Sour Cream and Onion Potato Chip - 5 oz. Terra Sweets and Beets Chips - 6 oz. Beet and Sea Salt Chips 6.4 oz. Stacys Naked Pita Chips - 1.5 oz. Stacys Parmesan Garlic and Herb Pita Chips - 1.5 oz. Stacys Cinnamon Sugar Pita Chips - 1.5 oz. KK Dill Pickle Caddy - 2 Oz. Lays Baked Potato Chips - 2.125 Oz. Fritos Corn Chips - 16 Oz. Stacys Simply Naked Pita Chips - 18 Oz. Crazy Hot Chips - 0.7 Oz. Potato Chips Variety Pack - 1.5 Oz. Beanitos Hint of Lime Chips - 6 Oz. Beanitos Simply Pinto Bean with Sea Salt Chips - 6 Oz. Beanitos Chipotle BBQ Black Bean Chips - 6 Oz. Original Exotic Vegetable Chips - 5 Oz. Beanitos Original Black Bean Chips - 1 Oz. Simply Sunny Multi-Grain Tortilla Chips - 5.5 Oz. Doritos Cool Ranch - 2.875 Oz. Mr. Cheese O's Parmesan Snacks - 1 oz. Mr. Cheese O's Parmesan Snacks - 3.75 oz. Mr. Cheese O's Parmesan Crisps Cheese Snacks - 1 oz. Wholesale potato chips for your restaurant and concession stand needs including kettle chips. Buy everything from wholesale pretzels and corn chips to individually wrapped chips and vending machine chips. The flavors are off the chart, running from pepperoni and roasted garlic to black bean and cheddar pinto bean. Other favorites include Cinnamon Pita Chips, Olive Oil Kettle Chips (one of 25 flavors) and Sweet Vidalia Kettle Chips, made with special sweet onions grown only in Georgia! Popchips veggie potato vending chips come in 0.8-ounce sizes in sea salt and olive oil flavors. Also check out the Terra Mediterranean Veggie Chips and Uncle Rays Kosher Dills.